3D Level Scanner II delivers continuous accurate measurement of bulk solids and powders regardless of the type of material or product characteristics, shape and size of storage silo, bin, container or warehouse, and harshness of the storage environment. 3D Level Scanner II employs an array of 3 antennas, each being a trans-receiver transmitting and receiving low frequency acoustic impulses. 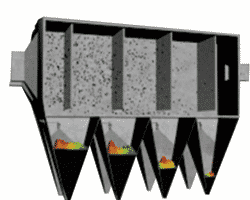 This patented design provides the scanner a very high beam angle of 30-70 degree covering the whole surface of the silo/ bin/ warehouse/ stockpile along with its unique Dust Penetrating Ability and Self Cleaning Ability. • Wide Beam Angle (70 to 80 degree) covers the whole silo/ bunker surface. • Works even in heavy dust. 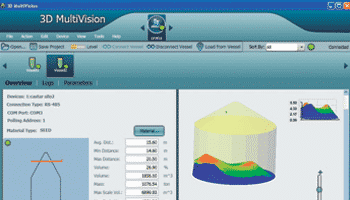 • Provides True Level, Maximum Level, Minimum Level, Volume and Mass along with the Real Time 3D Profile of material. LIMACO became the first company in the world to develop and use the serial production of radar level gauges operating at a frequency of 94 GHz and, by some characteristics, leaving all the internationally known radar level gauges behind. The high performances have been achieved by using the inventions and unique technologies worked out at various stages of advanced R&D. Limaco Radar level transmitters are non contact measuring device, which are suitable for high temp., high pressure, and corrosive applications. 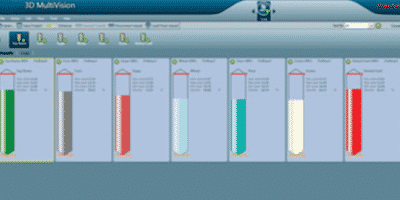 It is easy to install and free of maintenance,especially for the high accuracy requirement environment. The Radar Level Meters are excellent devices for non contact level measurement.The microwave impulses, emitted by the radar’s antenna, travel at speed of light and a part of their energy, reflected by the surface of the medium to be measured,is received by the same antenna.The period of time (flying time) between the emission and the arrival of the impulses, is proportional to the existing distance between the antenna and the surface of the medium to be measured. The radar level transmitters use a suitable demodulation technology that allows them to identify the period of time between the emission of the impulses and their corrected reception and consequently determine and measure the level.An integrated temperature sensor compensates the temperature in real time. 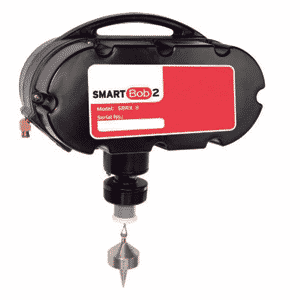 The Radar Level Meters can be installed both in metallic or non metallic tank. 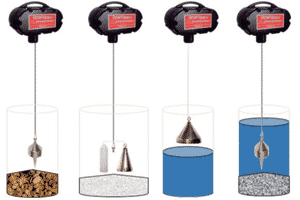 The ultrasonic impulses generated from transducers “antenna system”, which travel at the speed of sound, come reflected by the surface of medium and newly sent back to the transducer. S=CXT/2, where S: distance, C: velocity of sound, T: time lapse. A heavy-duty motor releases a strong, stainless steel aircraft cable from the supply pulley and a weighted sensor probe quickly descends to the surface of the material.During the descent, the pulses with a high resolution micro-controlled optical sensing system are generated. When the sensor probe touches the material surface, pulses are momentarily stopped and measurement information is transmitted. The absence of pulses also causes the motor to reverse and retract the sensor probe. A second confirming measurement is taken as the probe retracts and is compared to the descend measurement. 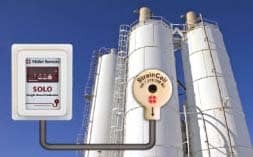 SOLO is a turnkey, non intrusive, fully temperature compensated and continuous silo weight and level measurement solution that includes intelligent single vessel electronics, junction boxes and our patented Strsin Cell sensors which measure weight with high level of accuracy at the nano level. The strain cell automatically compensates measurement errors caused by ambient temperature. High-frequency microwave pulses transmitted by the guided wave radar propagates along the detector component (wire cable or steel bar), and are reflected on the surface of the medium. After reaching the dielectrics to be measured, part of the pulse energy is reflected. The time interval between the emission of the pulses and their arrival is proportional to the distance between the surface of the medium and the reference plan of the instrument. 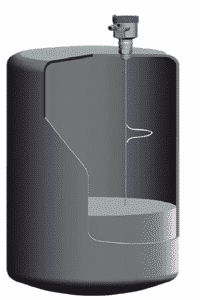 The instruments have a low consumption; it can be installed on metallic or non metallic tanks. Their use is not harmful to humans or environment. 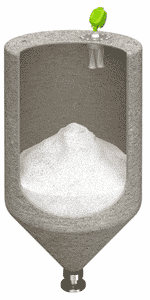 The AL40/100 is a non-contact level and distance measuring instrument, designed for granular materials and opaque liquids. The narrow beam characteristics of a laser allow direct aiming to a target surface, without interferences from structures or falling material. The unit can measure from as little as a few centimeters in a con ned space, to as much as 100 metres to the bottom of a silo. Along with the visible laser pointer, and easy setup via the membrane keypad and LCD display, the AL40/100 makes for a plug and play solution for most level and distance measurement applications. The AL40/100 uses a high speed laser pulse to measure distance. Laser light is emitted towards the surface, and the re ection is detected by a sensitive optical receiver. The time is takes for the light to travel to the surface and back, is directly proportional to the distance. 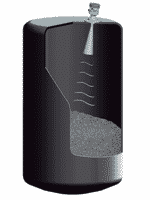 The unique performance and characteristics of a laser allow it to be used for short and long rage distances, in many applications. If you can see the target surface clearly, then the AL40/100 can measure the level. An optional dust tube is recommended for dusty applications, which helps in keeping the lens dust free for longer.